The new Avengers 4 trailer makes you yearn for the simple days of Infinity War. Back then, the question was simply 'Where's Hawkeye?' Now Jeremy Renner's Clint Barton has been revealed, but it only throws up more questions. One of them, funnily enough, is still 'where's Hawkeye? ', although the exact location feels less pertinent now we (and Black Widow) have seen him somewhere in Japan. But there's also the question of what happened to him and his family, what's with the new look, and why is he stabbing someone and going full-Samurai? This change in appearance and demeanour has been a long time coming for the MCU's resident guy with a bow-and-arrow, with set photos first suggesting it way back in October last year. Now it's confirmed though: Hawkeye is indeed Ronin. Not to be confused with the underrated 90s action flick of the same name, nor former lead singer of Boyzone Ronan Keating - although it looks like Clint's life has indeed been a rollercoaster - Ronin is very much as he looks: a sword-wielding badass. Echo was the first character to take on the identity of Ronin, before Clint assumed it he was killed and then resurrected by Scarlet Witch (around the events of House of M). When he returned, he didn't feel comfortable taking up his old mantle, and so borrowed - and then fully adopted - the Ronin moniker instead. 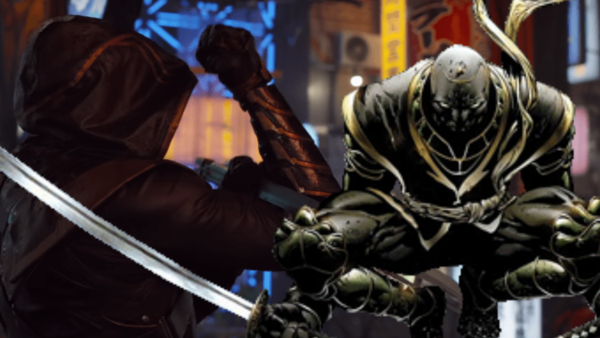 A darker (in costume and personality), more driven, lone warrior type, Hawkeye-as-Ronin shows great proficiency with an array of weapons, including the katana. It looks like that's making the leap to the screen, with Hawkeye stabbing a guy rather than using his old bow-and-arrow. The reason for Hawkeye's change in Avengers: Endgame seems clear. Given he was on his own journey previously, and is now back after the Decimation, the horrible likelihood is that his family was killed when Thanos clicked his fingers, leading to him going it alone. It also means he can better disguise his identity. We know from Infinity War that Hawkeye is under house arrest, but as Ronin he can go back out and fight crime. This too has basis in the comics, as he fights as Ronin while the Superhero Registration Act is in effect. It's certainly a great new look, and it seems as though Renner is going to get much more to do here than in previous movies. With a new suit, new attitude, and a newfound appreciation from audiences, it's going to be awesome to see. What do you think of Hawkeye becoming Ronin? Let us know down in the comments.